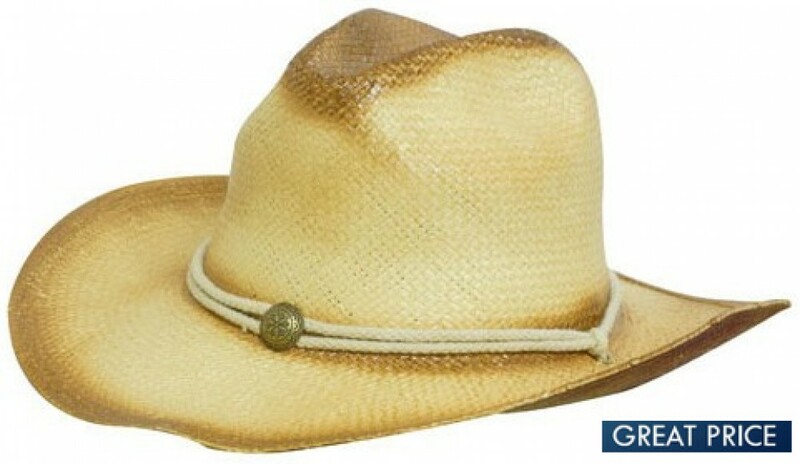 This is a great two-toned sprayed rustic straw cowboy hat with a rope band. This hat has a woven criss-cross design, looking good and improving air circulation. The edges and top are darkened to add some contrast. Then the entire hat was sprayed with a clear coat, preserving the straw and making the hat rigid. The hat features an elasticized sweatband to wick away moisture. The band is adjustable, allowing the hat to fit head sizes up to a Large. The rope band adds to the rustic look perfectly and has a small attached emblem. This hat only comes in a natural straw colour with a darkened top. These classic two toned cowboy hats will look great when branded with your logo. They look great and make terrific uniform hats for employees in outdoor areas, or promotional sales items for country businesses. These hats are also suitable for country music events, and any business that wants to take advantage of this cool country look. Standard price includes embroidery of up to 8000 stitches. Ask for pricing information on other branding options. Please provide your branding artwork in eps, pdf or high-resolution jpeg format. The listed prices exclude GST and delivery costs. Ask about our digital mock-up service.